Several Navy personnel in white dress. The UNSC Navy Dress Uniform is the standard uniform worn by the officers and ratings of the UNSC Navy during special occasions such as parties, parades, and memorial services, as opposed to the service uniform and working uniform, which are worn in garrison and aboard ship. The Navy maintains two types of dress uniform, a different one worn depending on occasion. Miranda Keyes in white dress. The white uniform is a more formal uniform known to be worn during award ceremonies. It consists of a high-collared double-breasted white jacket with gold-colored buttons, a white undershirt, and white trousers. The seams of the jacket on the left breast, right shoulder and back are picked out with red stitching. Rank insignia is displayed on the epaulettes and jacket cuffs. Decorations are displayed on the left breast, typically full medals, though heavily-decorated officers such as Fleet Admiral Lord Hood may choose to display only a handful of medals below a smaller but more extensive set of ribbon bars. Personnel who are entitled to may wear an aiguillette with the jacket. Headgear is a peaked cap, with a different design for females. Hats are decorated with an officer crest. Those ranked Commander and above wear gold "scrambled egg" oak leaves on their caps. Fleet Admiral Lord Hood, Commander Miranda Keyes, and a number of other Naval officers wore this uniform in a highly-publicised awards ceremony aboard Cairo Station over Earth in October 2552. The black dress uniform consists of a black tunic, jacket, and trousers, with matching headgear. [note 1] As with the white dress uniform, epaulettes are worn on the shoulders, while ribbons are worn on the left breast, though full medals are not worn. Unlike the white uniform, qualification badges may also be worn with this uniform on the right breast. Rank insignia is also displayed on the cuffs. The tunic's collar is decorated with a pair of five-pointed stars. White gloves may also be worn, and ceremonial weapons may also be carried. A thin single-breasted jacket showing badges and decorations may be worn over the tunic, typically worn during events that take place outside such as commissioning ceremonies. Headgear is a black peaked cap which bears the officer crest: A stylised black United Nations globe-and-olive-wreath on a silver shield, backed by two crossed gold fouled anchors, surmounted by a silver eagle. Fleet Admiral Lord Hood in white dress. An unidentified Commander in black dress at the opening of the post-war Living Monument. Three officers, among them Captain Andrew Del Rio in black dress at the UNSC Infinity's commissioning ceremony. 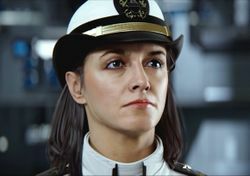 Commander Miranda Keyes (foreground) in white dress, displaying the female design of the peaked cap. Franklin Mendez in navy dress. Spartan-IIs in black dress uniform. ↑ This section describes the dress uniform worn by the Commander in the Living Monument trailer and by Andrew Del Rio and other senior officers in The Commissioning trailer.